TUDAR KALAVEDIKE, is a cultural team, which came into existence with an aim to save the cultural life of Tulunadu, a great piece of land believed to be created by Lord Parashurama, as the legend says. The meaning of Tudar is 'LIGHT'; hence the aim of Tudar Kalavedike is to spread the light of culture. TUDAR KALAVEDIKE is the dream child of Mr. Janardhana Padupanambur, a gazetted officer of Karnataka State Govt., a well-known writer, who is the main pillar behind the success story. He is the writer, director of the themes depicted. Presently, Tudar Kalavedike is staging 3 cultural shows. 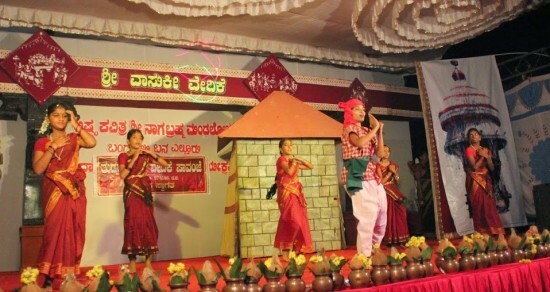 TULUNAAD NAMMA NAAD is a show which reflects the culture of the people of Tulunaad. The life style, the various festivals, the stories behind the temples of Tulunaad are very well displayed through this play. AGOLI MANJANA is a drama about a very famous heroe of Tulunaad, Manjana. DEVER ULLER is a show which reveals the stories that there is an eternal power called god. TUDAR KALAVEDIKE has already staged 25 shows of TULUNAAD NAMMA NAAD in various parts of Dakshina Kannada and Udupi Districts. It has about 65 artists from every corner of life from only Devadiga Community in the age group of 10 to 70 years. Tudar Kalavedike, is a wing of DEVADIGA SANGHA, PAVANJE, HALEANGADI.